Dakine Snow Tools - Dakine Nitrous Cake Cold Snow Wax - Assorted :: Unisex > Snow Accessories. 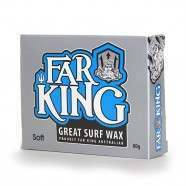 Formulated for use in temperatures 5 to 20oF -17 to -7o C. 3oz/85gDakine cold weather waxWeight: 6 oz (170 g)A good cleaning. maintenance and performance toolEnhance of the speed of your boardThree stage application - iron on. scrape off. buff into the base Size: one size.